As of 2011, most Armenians are Christians (94.8%) and are members of Armenia's own church, the Armenian Apostolic Church, which is one of the oldest Christian churches. 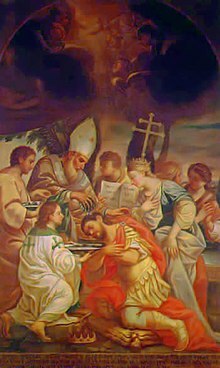 It was founded in the 1st century AD, and in 301 AD became the first branch of Christianity to become a state religion. According to Pew Research publication in December 2018 Armenia is the 2nd most religious country among 34 European nations with 79% of respondents saying they believe in God with absolute certainty. In the 21st century, the largest minority Christian churches in the country are composed of new converts to Protestant and non-trinitarian Christianity, a combined total up to 38,989 persons (1.3%). Due to the country's ethnic homogeneity, non-Christian religions such as Yazidism and Islam have only few adherents. Approximately 98.1 percent of the country population is ethnic Armenian. Armenians have a very strong cultural connection to the Armenian Apostolic Church. About 93% of citizens belong to the Armenian Apostolic Church, an Eastern Christian denomination in communion with the other Oriental Orthodox churches. The Armenian Apostolic Church has its spiritual center at the Etchmiadzin Cathedral. The head of the church is Catholicos Karekin II. According to the Census of 2011, the composition of people identifying with religions in Armenia is the following: Christianity 2,862,366 (94.8%), of whom 2,797,187 are Armenian Apostolic (92.5%); 29,280 Evangelical; 13,996 Armenian Rite and Latin Rite Catholic; 8,695 Jehovah's Witness; 7,587 Eastern Orthodox (Russian, Ukrainian, Georgian, Greek); 2,874 Molokan (non-Orthodox Russians); 1,733 Assyrian Church of the East (Nestorian); 733 Protestant; 241 Mormon; 23,374 Yazidi (0.8%); 5,146 Pagan (0.2%); 812 Muslim; 5,299 people of other religions (0.2%); 121,587 no response (4.0%). Yazidis are concentrated primarily in agricultural areas around Mount Aragats, northwest of the capital Yerevan. They live in 19 villages in the Aragatsotn Province, two villages in the Armavir Province, and one village in the Ararat Province. Armenian Catholics live mainly in the northern region, in seven villages in the Shirak Province and six villages in the Lori Province. Molokans live in 10 villages in the Lori Province, two villages in the Shirak Province, and two villages in the Gegharkunik Province. Most Jews, Mormons, Baha'is, Eastern Orthodox Christians, and Western Catholic (Latin Rite) Christians reside in the capital Yerevan, which has attracted a greater variety of peoples. Yerevan also has a small community of Muslims, including ethnic Kurds, Iranians, and temporary residents from the Middle East. Foreign missionary groups are active in the country. The Constitution as amended in 2005 provides for freedom of religion and the right to practice, choose, or change religious belief. It recognizes "the exclusive mission of the Armenian Church as a national church in the spiritual life, development of the national culture, and preservation of the national identity of the people of Armenia." The law places some restrictions on the religious freedom of religious groups other than the Armenian Church. The Law on Freedom of Conscience establishes the separation of church and state but it grants the Armenian Church official status as the national church. Procession of Armenian Apostolic priests. According to tradition, Christianity was first introduced to this area by the apostles Bartholomew and Thaddeus in the 1st century AD. Armenia became the first country to establish Christianity as its state religion when, in an event traditionally dated to 301 AD, St. Gregory the Illuminator convinced Tiridates III, the king of Armenia, to convert to Christianity. Before this, the dominant religion was Armenian paganism, under the theological influence of Zoroastrianism. Hetan "fire and sword" ritual of initiation at the Temple of Garni of Mihr-Vahagn. Hetanism (Հեթանոսություն, Hetanosutyun) is a neo-ethnic religion movement in Armenia. Adherents call themselves "Hetans" (Hetanos հեթանոս, the Old Armenian biblical term loaned from Greek ἐθνικός "gentile"). The movement traces its origins back to the work of the early-20th-century political philosopher and revolutionary Garegin Nzhdeh and his doctrine of tseghakron (rejuvenation through national religion). In 1991, it was institutionalized by the armenologist Slak Kakosyan into the "Order of the Children of Ari" (Arordineri Ukht). The doctrine and mythology of the Hetan movement is codified into a book, the Ukhtagirk, written by Kakosyan himself. The movement is strongly associated to Armenian nationalism. It finds some support from nationalist political parties of Armenia, particularly the Republican Party of Armenia and the Union of Armenian Aryans. Ashot Navasardyan, the founder of the Republican Party, which is also the currently leading party of the country, was a Hetan himself, as many other members of the party are. Due to the early Christianization of Armenia, very little is known about the historical pre-Christian religion of Armenia. Armenian Neopagans worship the gods of a reconstructed Armenian pantheon: Haik, Aray, Barsamin, Aralez, Anahit, Mihr, Astghik, Nuneh, Tir, Tsovinar, Amanor, Spandaramet, Gissaneh, with a particular emphasis on the cult of the solar god Vahagn. They have re-consecrated the Temple of Garni (a Hellenistic-style temple rebuilt in 1975), originally a temple to Mihr, to Vahagn, and they use it for regular worship and as a center of activity. Hetanism is a growing ethnic religious ("pagan", often defined "neopagan") movement. One survey suggest that indigenous Armenian religion is widespread and accepted by the population to the same degree as Christianity is. This may be due to the fact that there is no conflict between the Arordineri Ukht (the major Hetan organization) and the Armenian Apostolic Church; they coordinate their efforts in preserving Armenian cultural identity and in fighting foreign forces. The Arordineri Ukht is even supported by the ruling Republican Party of Armenia, which in turn bases its ideology on tseghakron (native religion) and on the Hetan sacred book Ukhtagirk. "Fire and sword" rituals of the Hetan tradition are often organized on the site of Apostolic churches and patronized by Apostolic priests. The Catholic Church in Armenia is divided between Latin Rite parishes (subject to Apostolic Administration of the Caucasus) and Armenian Catholic Church's parishes. The 2011 census counted 13,996 Catholics. Since the end of the Soviet Union, American Protestant missionaries have been proselytising in the country. The 2011 census counted 29,280 Evangelicals (1% of the population) and 773 mainline Protestants. According to the Census of 2011, there are 7,587 adherents of Eastern Orthodoxy in Armenia, mainly Russians, Ukrainians, Georgians and Greeks. Russian Orthodox community is centered around Church of the Intercession of the Holy Mother of God in Yerevan, consecrated in 1912. According to the Census of 2011, there are 2,874 Molokans in Armenia. According to the Census of 2011, there are 1,733 Nestorianists in Armenia. The Jehovah's Witnesses have estimated their membership at 11,500; the 2011 census found 8,695. The Church of Jesus Christ of Latter-day Saints claims approximately 3,000 adherents in Armenia at the end of 2011; the 2011 census found 241. About 1% of Armenia's population (23,374 as per the 2011 census), mostly ethnic Yazidis, an ethno-religious group living in the western part of the country, follow Yazidism, one of the Yazdan religions. Many Yazidis came to Armenia and Georgia during the 19th and early 20th centuries to escape religious persecution. Relations between Yazidis and Armenians are strong. The world's largest Yazidi temple is constructed in the small village of Aknalich. Currently there are an estimated 750 Jews in the country, a remnant of a once larger community. Most left Armenia for Israel after the collapse of the Soviet Union because of in pursuit of better living standards. Still, despite the small numbers, high intermarriage rate and relative isolation, a lot of enthusiasm exists to help the community meet its needs. Azeris and Kurds living in Armenia traditionally practiced Islam, but most Azeris have fled the country due to the Nagorno-Karabakh War. In 2009, the Pew Research Center estimated that less than 0.1% of the population, or about 1,000 people, were Muslims. The 18th century Blue Mosque is open for Friday prayers. Throughout the history Armenians did not convert to Islam in large numbers despite long periods of Muslim rule. During the Arabic conquest, Islam came to the Armenians; however, very few Armenians converted to Islam, since Christians were not required to convert by Muslim law. There is, however, a minority of ethnic Armenian Muslims, known as Hamshenis, the vast majority of which live outside of Armenia mostly in Turkey and Russia. The Bahá'í Faith in Armenia begins with some involvements in the banishments and execution of the Báb, the Founder of the Bábí Faith, viewed by Bahá'ís as a precursor religion. The same year of the execution of the Báb the religion was introduced into Armenia. During the period of Soviet policy of religious oppression, the Bahá'ís in Armenia lost contact with the Bahá'ís elsewhere. However, in 1963 communities were identified in Yerevan and Artez. Following Perestroika the first Bahá'í Local Spiritual Assemblies of Armenia form in 1991 and Armenian Bahá'ís elected their first National Spiritual Assembly in 1995. As of 2004 the Bahá'ís claim about 200 members in Armenia but as of 2001 Operation World[unreliable source] estimated about 1,400. Since the early 1990s, foreign missionaries, esoteric and sectarian groups entered Armenia. ^ a b c d e f "Armenian Census 2011" (PDF) (in Armenian). p. 7. Retrieved 25 October 2015. ^ Evans, Jonathan; Baronavski, Chris. "How do European countries differ in religious commitment? Use our interactive map to find out". Pew Research Center. Retrieved 2019-01-09. ^ Media, Ampop (2017-12-26). "Կրոնական կազմը Հայաստանում | Ampop.am". Ampop.am. Retrieved 2018-01-25. ^ a b Yulia Antonyan. Re-creation of a Religion: Neopaganism in Armenia. Yerevan State University. This and other papers about Armenian Hetanism are available here. ^ Karine Ter-Saakian. "Armenia: Pagan Games". CRS Issue 247. The Armenian Apostolic Church takes an unusually relaxed view of its pagan competitors, considering its hostility to more recent evangelical groups." ^ Sherwood, Harriet (25 July 2016). "World's largest Yazidi temple under construction in Armenia". The Guardian. Retrieved 31 July 2016. ^ Quinn, Sholeh A. (2009). "Aqasi, Haji Mirza ('Abbas Iravani)(c. 1783–1849)". In Morrison, Gayle. the Bahá’í Encyclopedia Project. Online. National Spiritual Assembly of the Bahá’ís of the United States. ^ Effendi, Shoghi (1936-03-11). The World Order of Bahá'u'lláh. Haifa, Palestine: US Bahá’í Publishing Trust, 1991 first pocket-size edition. pp. 64–67. ^ Monakhova, Elena (2000). "From Islam to Feminism via Baha'i Faith". Women Plus…. 2000 (03). ^ a b Hassall, Graham. "Notes on Research on National Spiritual Assemblies". Research notes. Asia Pacific Bahá'í Studies. Retrieved 2009-05-05. ^ Ahmadi, Dr. (2003). "Major events of the Century of Light". homepage for an online course on the book “Century of Light”. Association for Bahá’í Studies in Southern Africa. Archived from the original on 2009-09-02. Retrieved 2009-05-05. ^ U.S. State Department (2005). "Armenia International Religious Freedom Report 2004". U.S. State Department Bureau of Public Affairs. Retrieved 2009-05-05. ^ "Republic of Armenia, Hayastan". Operation World. Paternoster Lifestyle. 2001. Retrieved 2009-04-22. This page was last edited on 30 March 2019, at 08:07 (UTC).